Previous post: Don’t Touch The Flight Attendant! When I read about British Airways’ new high-tech blanket, called “the “happiness blanket,” my first thought was that it had to be a joke. 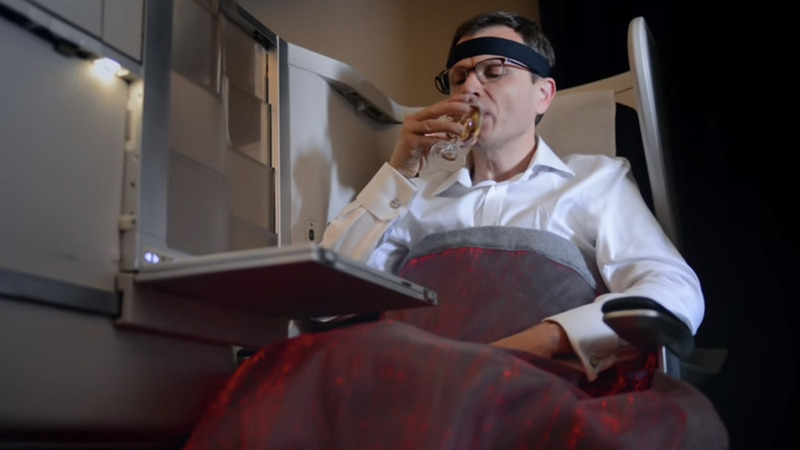 A blanket that analyzes the “meditative state” of premium cabin fliers? What a waste of money. I don’t need fiber optics to tell you when a passenger is stressed and anxious, or how to make them more relaxed.Try two more inches of legroom, and a seat that fully reclines. And a neighbor who isn’t chatting about the shade of their blanket. Plus, if you’re sleeping, don’t you think you’re pretty relaxed? Is there anyone who really wants everyone knowing that much about them? Having your mood transmitted to the rest of the cabin sounds like something that could make you even more anxious. Sure, we live in the age of Facebook where we put it all out there for the world to see, but at least we have some control over what we share. Imagine seeing 3B turning a dark shade of red. Must have been the pasta. (No joke: that tortellini in a cream sauce makes some passengers freak out.) Or imagine the opposite about 3A; we don’t really want to know why he’s so happy with his blanket, do we? If you know what I mean. OK … I’m waiting for the video of an entire cabin orchestrating a light show concert with these things. The only question is how long it will take before this happens. Personally, I think they should link these things to the call button … so FAs can know where they’re most needed.